Microsoft Works has been created to gather and run all this programs components in a single window, but this changed when the version 5 was released. This program was designed and worked for machines that had low RAM capacity. Version 5 gave the possibility to run the component parts in single windows, and this has become more and more similar to today’s Microsoft Office. However, Microsoft Works gave the option to use it even on DOS and Mac OS, but despite this feature the program was changed into Office Starter available since 2010. Some of the features have been changed and additions have been excluded, however, there are some important features we should mention. Even if today, the old program has been assigned a different look and feature, the basis remained the same, this is quite unique considering that other programs have been changed and replaced by others. And, honestly speaking, Microsoft Works is as efficient as Microsoft Office in most of the cases even if some features have been removed for good. Microsoft Works can be at the same time very simple and easy to use, as well as very complex and embedded with lots of features. Probably, we can argue here the compatibility with other systems, but this is not an impediment as all office programs allow to save work using setting changes. And all features could vary according to the user level and could be on a macro or low level functions. Depending on the version and program used, features can be different, but they will include spread sheets, recognized as having the .xlr extensions and word processing but at a basic level, the difference being that the file extension will be .xps unlike Word that uses the extension .docx. For users that do not use office programs on a daily basis, Microsoft Works could be enough to satisfy the needs, but for those that have the work office – based, then an upgrade would be beneficial. 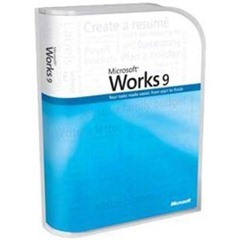 Microsoft Works is not recommended to be used for large organizations but for small offices or home businesses, the simplicity of the program is quite efficient (the formats are recognized as .wks for spread sheets, .wdb for databases and .wps for word processors). The version for home users in 4.5a and this allows even complex transformations using formulas and reports can be placed on the clipboard as text.